Biodynamic compost is enhanced and enlivened through the use of six preparations made from yarrow, chamomile, stinging nettle, oak bark, dandelion, and valerian (#502, 503, 504, 505, 506, and 507, respectively). Each of these medicinal herbs is transformed through a unique process that brings it into relationship with the animal kingdom, the earth, and the cycle of the year. Bringing these elements together magnifies their healing qualities, fosters the growth of beneficial bacteria and fungi, and creates powerfully concentrated substances to guide the development of the compost. A small quantity of each preparation is added to the compost pile just after it is built, and again after it is turned. Biodynamic preparations strengthen the quality of the compost by stabilizing nitrogen and other nutrients, multiplying microbial diversity, and bringing more sensitivity to the composting process. Biodynamic compost helps attune the soil to the whole farm organism and wider influences while increasing soil life and stable organic matter. Biodynamic compost also brings more carbon into the living realm, helping to restore balance to the climate. 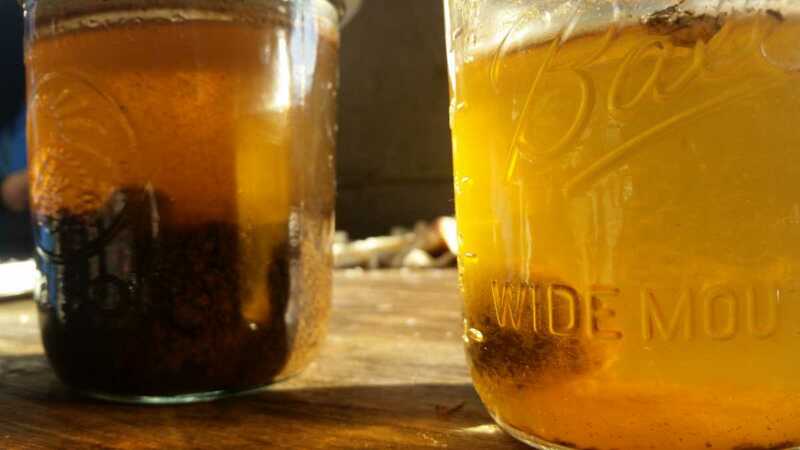 In addition to the compost preparations, several biodynamic preparations are applied as potentized liquid sprays to bring healing, vitality, and sensitivity to the farm and garden. Horn manure (#500) enhances the life of the soil and the relationship between soil and plants, and is made from cow manure buried inside a cow horn during the winter months. Horn silica (#501) increases plant immunity, strengthens photosynthesis, enhances ripening, and is prepared from ground quartz crystals buried in a cow horn over the summer months. Horsetail tea (#508) helps prevent fungal diseases and balances the watery element in plants and soil. Together, the biodynamic spray and compost preparations bring plants into a dynamic relationship with soil, water, air, warmth, and cosmos to help them develop in a healthy and balanced way, access the full spectrum of nutrients they need, and become more resilient to pests, diseases, and extreme climate conditions. Further information on the preparations is available in the footnotes of our Biodynamic Principles and Practices page, through our Biodynamic Research Portal, through the preparations tag on our blog, or in the books listed below. Also check out our webinars and online courses for educational opportunities related to the preparations and other biodynamic principles. You don't need to make your own preparations to get started. Ready-to-use biodynamic preparations can be purchased from professional preparation makers, including those listed below. Many regional biodynamic groups make the biodynamic preparations together as a seasonal community activity. Joining a regional group is a great way to learn how to make the preparations, and often finished preparations can be purchased from someone in the group. JPI's mission is to heal the earth through production of quality biodynamic preparations, and to advance education and research in biodynamic methods. They are a source for purchasing the biodynamic preparations, an education center for all biodynamic practitioners as they begin to make their own preparations, and as a research venue focusing specifically on the biodynamic preparations. Biodynamic Source offers the expertise and efforts of BioSprays, a Biodynamic agricultural application service founded by Lloyd Nelson with Brook LeVan cofounder of Sustainable Settings, a 501 ©(3) corporation that was founded in 1997 that owns and operates the Demeter Certified 244-acres that make up the working ranch and Whole Systems Learning Center. Established by long-time biodynamic prep maker and JPI founder Hugh Courtney and his grandson Jeremiah Proctor, Earth Legacy Agriculture was formed to support biodynamic producers, whether long-standing or under transition, through education and consultation services. Courtney has been making biodynamic preparations on the farm in Virginia since 1976. ELA produces and distributes biodynamic preparations and microbial activators and hosts various educational workshops. The Section for Agriculture commissioned, directed, and published this study on the biodynamic preparations (link is external). It is particularly directed towards the International Biodynamic Association (IBDA), Demeter International (DI) and the Circle of Representatives of the Section for Agriculture, and especially their member organizations and their individual members. This publication (link is external) contains 14 case studies with comprehensive and easily compared descriptions showing how a selected group of people from across the world work with the preparations in their own geographical and social contexts. At the science conference of the Section for Agriculture in Dornach in September 2018, the Section for Agriculture began a research project to discuss the use of plants for compost preparations in biodynamic agriculture and horticulture in tropical and subtropical regions, and to find new solutions where necessary. They met again in the International Working Group for biodynamic preparations in February 2019 in Dornach. "Only What Is Fruitful Is True"
Stewart Lundy of Perennial Roots Farm discusses assessing quality (link is external) of the preparations and the value of hands-on learning with Hugh Courtney of Earth Legacy Agriculture. Wali Via of Winter Green Farm illustrates how the biodynamic preparations can be viewed as healing remedies for the Earth, as when working with the biodynamic preparations we are harnessing the life forces in a way that allows them to act as catalysts to enhance the health and balance of our farm. Read more. 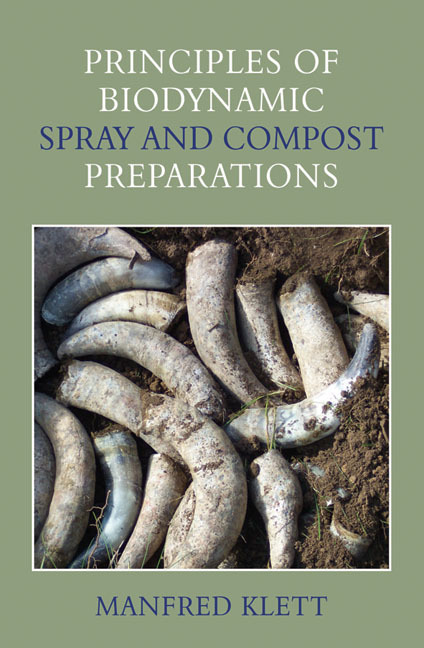 Principles of Biodynamic Spray and Compost Preparations (link is external): In this book, renowned biodynamic expert Manfred Klett explores the preparations in depth, covering both the practicalities of spray and compost preparations and the philosophy behind them. 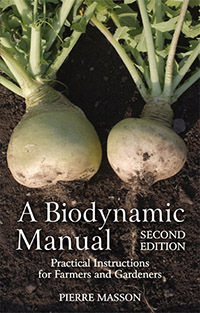 A Biodynamic Manual (link is external): Also a comprehensive introductory biodynamic farming book by Pierre Masson, with detailed information about making, using and storing the preparations, including photographic illustrations and diagrams.